Wow, you look amazing! Such an inspiration. Hi Susan! You look amazing! And you ARE amazing! So proud of you and very inspired by your story! Keep it up girl! You are an inspiration! Way to go Sue!!! You are an amazing, strong woman! Your hard work has been an encouragement! You look amazing :) a reflection of what I'm sure you've always been on the inside! It has been so inspiring to watch you and Katie go on this journey! What a wonderful post! Ok I'm a little teary eyed! 62 lbs!! In a year. That is truly AMAZING! Hats off to you for sure! And I am so impressed that you have only taken 15 days all year from tracking! What determination and perserverence that shows. Definitely inspiring! Contratulations! So very happy for you and here's to those last 8 lbs! You are almost there girl! I don't know why but I am sobbing like a little baby over here. The Christmas side by sides just did me in. You are so beautiful. I've always thought you were beautiful. But I'm just so overwhelmed by how far you came, and how you fought for yourself (and me) and helped spur me on to reach my goals, too. I love you so muchhhhhhhhhhh!!!! susan: you may not realize this, but you are an inspiration to those who are on ww! I wrote a post today about how I was going to quit in the fall but got back on program and love it! I KNOW you can get to your goal! almost there. So, I may or may not be tearing up over here. You look amazing, it's crazy the difference a year can make. If anyone had excuses to give up it was you, but you didn't. That, for me, is just THAT much more inspiring. And yes, you have inspired at least one person because I know as I begin my journey this year I'll be back here more than a few times to remind myself that it can be done. Happy one year anniversary to you skinny lady!!!! Look at you! So proud of you! Your face looks like I'm looking at someone else, not you. You look amazing! Way to go! I think the best thing you said is that you had every excuse to give up but you didn't, that is profound. So many people would say "well...but...this happened and so...next year" and you didn't! You used that to push yourself even more. That is amazing and inspiring. Congratulations to you!!! I am over hear from your sister's blog...she was gushing about your success so I thought I'd stop by and share in your success! You and your sister are both very inspirational!! You are an amazing woman, you need to know it! You know I'm one of those who daily wonder if I would ever change the way I look, or even more, the way I feel about my self. I am right there where you were a year ago, wearing a size 16 and feeling sorry for myself everysingle day. Yesterday after your tweet I also read this: "The day we decide to act it is our lucky day". So I have decided to start yesterday and I am happy with my decision... I KNOW this WILL be my year...and I thank you for such a HUMBLE and Inspiring story. you are my hero... and I am utterly happy for you! What an amazing post Susan...your determination is inspiring. You look so good, so happy, and so healthy. And the best part is that you lost the weight for YOU. Keep on going girlfriend..and I for sure think you should be a spokeswoman! Jennifer Hudson who? First off- congrats Susan!!! What an amazing goal you've achieved! Your story is so inspirational! You could definitely be the next spokesperson for WW! It's so exciting to see that all the hard work you put in paid off! You look amazing!! Happy new year! AMAZING!! You do inspire ppl, ME!!!! I get on my elliptical b/c I hear you and Kate telling me GO GIRL GET ON THAT THING!!! And I see how hard you both have worked this year and am so proud of you both!! Love YOU!!!! Oh yeah, I do have a question when you first started WW did you work out as well? Or did that come later? AMAZING Susan! You should be so proud! The fact that you picked yourself back up and kept on going depsite everything you went through is also an inspiration to me. I'm sitting here crying hahaha but that's not too surprising. You inspire me! Oh Susan, YOU are my inspiration for ME in this 2012 year!!! (No pressure, no pressure.) :P No, but in all seriousness, you are truly amazing! Huge congrats to you on your weight-loss anniversary. Sadly, I tried and failed last year on WW. I came to accept it and realized that it just was not my year, my time, my dedication at the moment. Even though I SAID I wanted to change (my body, my eating, my overall health) I did nothing. I took no action. And yes, I'd feel down for a couple of days but get over it and just go on w/ my unhealthy lifestyle. I always had an excuse: My Husband won't diet w/ me, NONE of my friends live close to me, there is not gym near by, the babies won't let me exercise. You name it, I said it! Ridiculous, right? I need to change, and THIS YEAR IS IT!!! I AM ready to be a better Ashlee: mind, body, and soul. :) There are so many things that I want to change in my life, all for the better, the weight-loss is just ONE thing. I just want to thank you so much for sharing your story and being a "real-life" person showing that it CAN be done. Believe me, I'll probably go to you for advice and just STICKING w/ it...b/c it's going to be hard, but I can do it. I have to do it. Susan, my friend, you look AWESOME!! Your journey has given me so much motivation! Your humble attitude and inspiration are what have made me jump on this "getting healthier" bandwagon! When I look at photos of myself from the last year, I think "omg, how did I let myself get there? I've never looked like this" ... and then I realize. I appreciate your vulnerability at showing us all your transformation! You rocked 2011, friend!! Oh my goodness, you were beautiful before, but holy cow, you rocked this whole WW thing and now you're a hottie! I'm so so SO impressed. You have every reason to be proud, and honestly, you and Katie are the reason I hopped on the treadmill that day before Thanksgiving. I figured if 2 regular girls like me could do it, then so could I. So I want to thank you for that. I've found a new love in running, and I owe it to you. 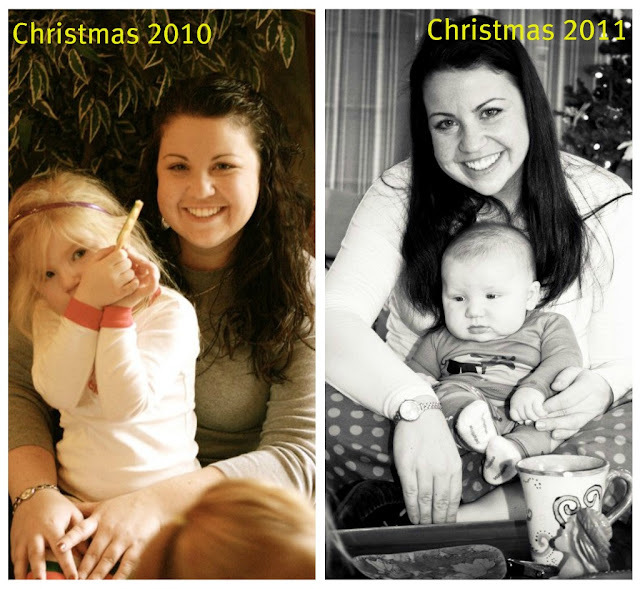 The Christmas comparison photos made me gasp. You are SUCH an inspiration. I have completely fallen off that fitness train that I was on and although I actually need to GAIN weight, I really need to gain my muscle tone back. If you can lose all!that!weight!, I can start the climb again. I told B last night that I felt like I was staring up a big mountain but I'm going to keep thinking of you as I start over on this journey. Hopefully in a few months, I'll be flexing in the mirror right along with you, sister. Absolutely amazing, I'm so proud of you!! You have make me think that I too can do it..
You look so great! I know it must be satisfying to look back over such a successful year- it's inspiring! So, so awesome! You look so great! What a wonderful accomplishment! I know you've inspired me throughout my weight loss! Happy 2012! You are AWESOME! Seriously! And i am inspired by you, again! Love the before & after pics. WOW! WAY TO GO! Especially while walking through such a difficult time. high five! Girl you have it going on!! So inspiring!! So amazing! Congrats on reaching your one year mark, and so many kudos to you for sticking it out even when things got crappy. I think that says a lot about how your lifestyle has changed, and that it's not just a fad or diet. Also, for whatever it's worth, I think it's neat how genuinely happy you look even when you weighed almost 70 lbs more than you do now. 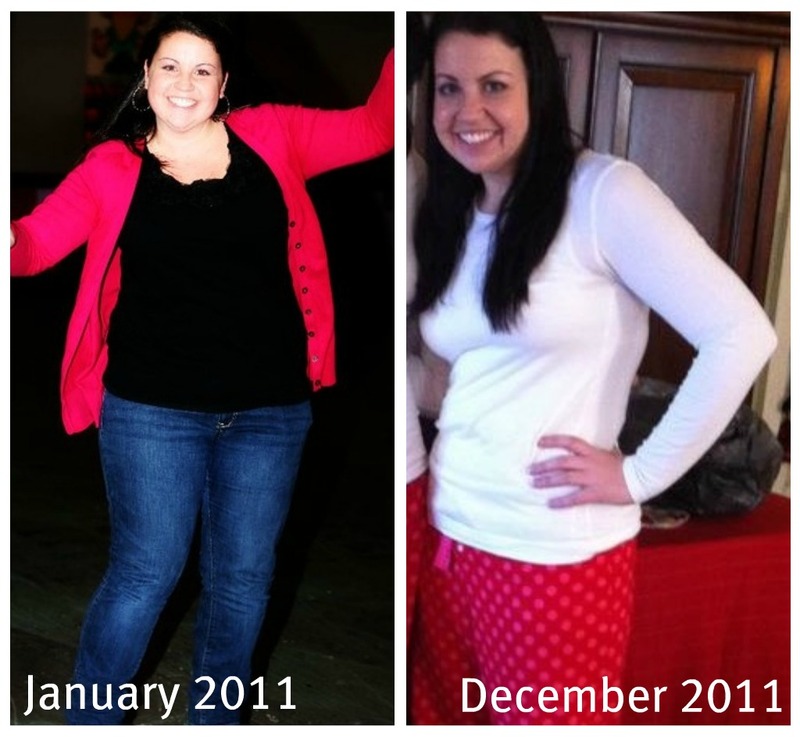 You just look and seem like a happy and positive person in general, now just a skinnier happy, beautiful person! Thanks for the advice on my blog!! I got my hubs to measure me last night!! I just found your blog and had to say you look AMAZING! Wow! I am so impressed and inspired. You look really happy in all of your pictures, but you look radiant and glow now - way to go! Hope you have a wonderful 2012!